This title features an array of fun and fabulous projects that all crafters will enjoy. This book covers it all - from making T-shirts and gifts to creating products to sell. It is also a guide to seeing old clothes in a new light, which is currently a very popular topic. In "Bend the Rules with Fabric", Amy Karol explores dyeing, silk screening, stamping, applique, transferring photographs and many other techniques, providing an array of fun and fabulous projects for crafters to get their teeth into. 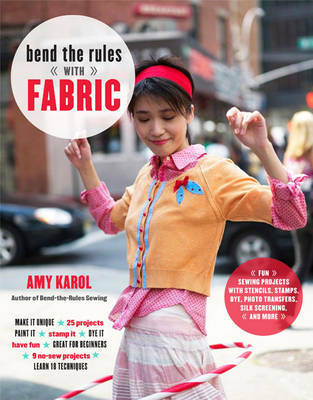 Whether readers use "Bend the Rules with Fabric" as a how-to for making T-shirts, a workbook for their kids' weekend projects, a manual for making their own products to sell, a guide for seeing old clothes in a new way, or as a fun resource for making custom gifts for family and friends, this comprehensive and creative book is sure to inspire! With 25 projects and 18 techniques to learn there's plenty for all crafters. This title also features 9 no-sew projects.